This online publication is free, and extensive quotes and segments are available to local newspaper media and specialist print and online publications. A link to lendarlinggirl.com would be appreciated. For national commercial use, and adaptation of the material to other media, use the ‘Leave a Reply’ box at the bottom to get in touch with the author. 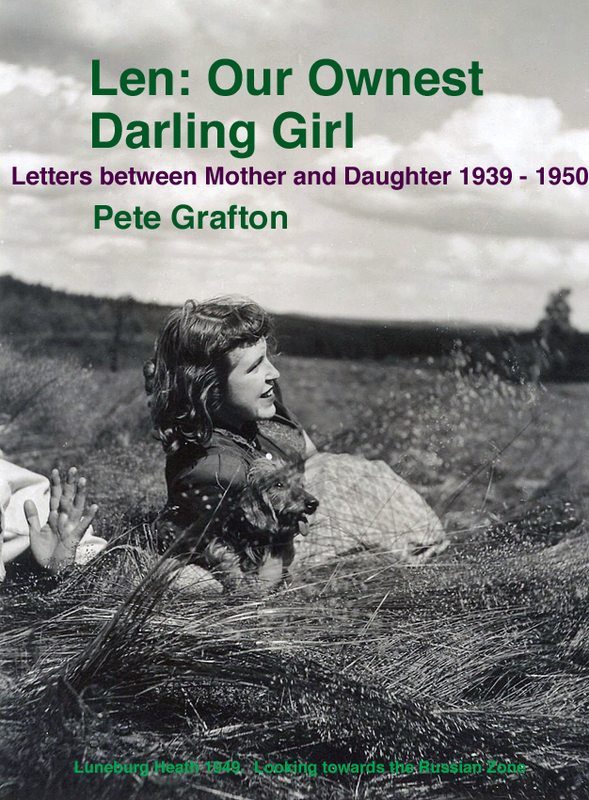 Pete Grafton writes: In early 2007 I bid on ebay for a collection of 130 black and white photo prints and photo negatives. I noticed that the seller had, in separate auctions, a large collection of letters, and a collection of memorabilia from the same period – the 1940s – and that all the material revolved around the same family. Successful in bidding for the three auctions I contacted the seller who told me that he had bought the material at an auction in London. Looking through the letters, together with the photos and memorabilia I quickly saw that the collection could form the basis of a remarkable book. I was aware of other material, usually culled from the Mass Observation files in Sussex University, that had brought to life the wartime and the immediate post-war period through the diaries of those participating in Mass Observation. (Nella Last’s War and Our Hidden Lives: The Remarkable Diaries of Post-War Britain are two well-known examples). The difference, and strength, of this uninhibited correspondence between mother and daughter was that they were not written for a third party. 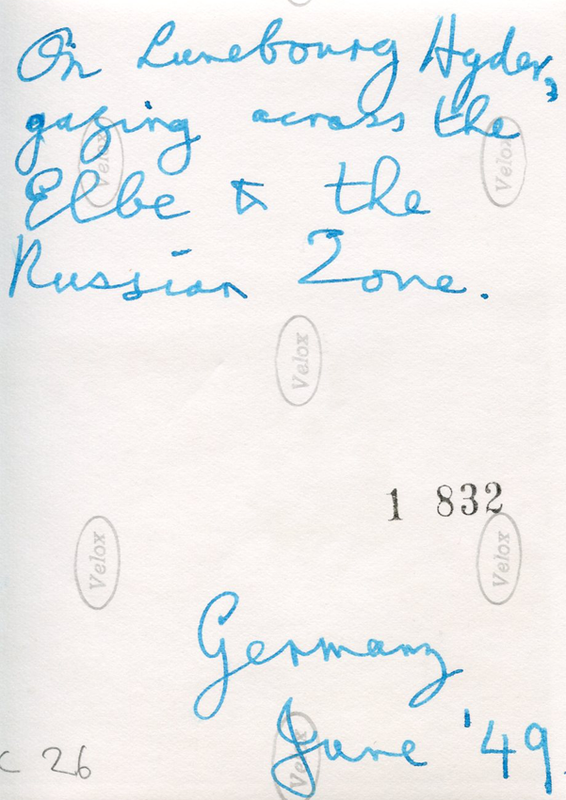 The core of the correspondence is the lively and intimate exchange of experiences and emotions between mother in Glasgow and her daughter – ‘Len’ – firstly in Cairo, working as a shorthand typist for the Ministry of Supply, then as a Personal Assistant at Porton Down, Britain’s Chemical and Biological Warfare research centre, and latterly in the Nazi-supporting Lord Londonderry’s Wynyard Hall in Co.Durham, on the post-war Emergency Teachers Training Scheme. I made the assumption that there were two possibilities about how the material had entered the public domain. Either that ‘Len’ was dead, or that she had dementia and was in care. I worked on the material for four years, transcribing the letters, referencing, and contextualising, and starting on a rough layout to include the visual material. Some of those four years were spent trying to trace surviving relatives and friends. The letters ended abruptly in 1950 and I wanted to know what happened next. I was also concerned about copyright issues. Full page features in the weekly press and following up every possible contact, and Births, Deaths and Marriages – the latter partially successful – led, in the end, nowhere. How could a family who had been so social in their lives disappear off the radar? Another possible lead which I followed up was a distant Swedish relative, Bjorn Palmgren, mentioned in several of the letters, and whose picture was in the photo collection. I keyed in Bjorn Palmgren on the Internet, and had many hits. Bjorn Palmgren is a fairly common Swedish name, and I drew a blank. The family connection was on Len’s Mum’s side of the family – the Mackays. So I keyed in Bjorn Mackay Palmgren and there he was! He was on a Family History Search site. The snag was he hadn’t looked at it for 18 months. I wrote to him, via the site in the late autumn of 2010. In January 2011 I got an email from him. It turned out that he had last heard from Len at Christmas 2008, almost two years after I’d bought her letters. She was having another operation for her hip. He hadn’t heard from her since. He gave me her last known address. I was given your address by Bjorn Palmgren. 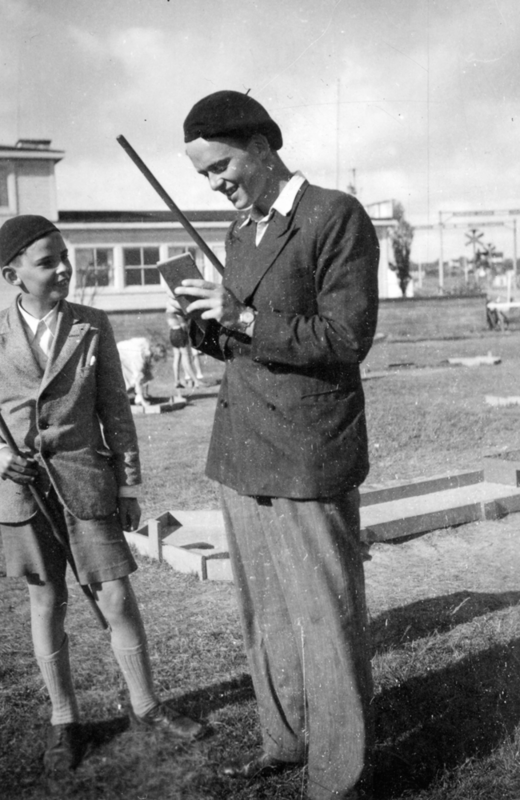 I contacted Bjorn, through the Internet, because I had a photo of him and Paul playing mini golf at Varberg in the summer of 1945. The background to this was that in 2007 I saw on the internet site ebay an auction for a collection of photographs from the 1930ʼs and 1940ʼs. As a non professional photographer I have an interest in ʻamateurʼ photos. I am also interested in political and social history and saw that the seller in two separate auctions was auctioning a collection of 140 letters, and a collection of memorabilia, also from the 1940ʼs. I realised that all three auctions related to the same family – your family: yourself and your Mum and Dad. I was successful in all three auctions and when I received the material I contacted the seller who told me he had bought them at a house clearance auction in London. I also saw, very quickly, that the letters between you and your Mum, together with the photos and memorabilia (embarkation ticket, menu, hairdresserʼs slip etc on board the Franconia, for instance, when your Mum sailed out to visit you in Cairo) could be the basis of a remarkable book. Firstly, to put you quickly in the picture: the correspondence between you and your Mum spans 1939 to 1950, covering mostly your time in Cairo with Stores Disposals, then Porton Down, and lastly Wynyard Hall. There are gaps in the correspondence. There are also a few letters from your Dad to you, and a few letters from Ena to your Mum. The photographs cover the 1920ʼs – you with a toy bunny rabbit with very long ears taken on the Isle of Man – through to 1949, with a photograph of you on Luneburg Heath. There are also some of your negatives: at York races, for instance. I printed the latter ( I have my own dark room). I would like to return your letters and the photos and memorabilia to you, and secondly, of course, I will not approach publishers with the almost completed book, but I would like to send a copy to you. I am so sorry if this has come as a shock. I would certainly be shocked if someone wrote to me saying they had acquired, in my case, my diaries from when I was a young man, and would-be writer. I bought the correspondence in good faith, and made assumptions that were obviously wrong. The remarkable book I refer to is the combination of your aspirations for yourself and for a better, decent world, set against a post war Britain, and the extraordinary fact that you were first in Egypt at a time of significant political upheaval, there and in the Middle East; that you were next at Porton Down (you mention in one of your letters back home when in Egypt that you had been reminiscing with a Major Wallace about Gruinard Bay, when perhaps unknown to you at the time Gruinard Island had been infected with anthrax by scientists from Porton); and then you were on the Emergency Teacherʼs Training scheme, at Wynyard Hall, the residence of Lord Londonderry, a prominent Nazi sympathizer in the 1930ʼs. (Hitlerʼs biographer Ian Kershaw has written Making Friends with Hitler, 2004, about him). In addition, of course, the letters between yourself and your Mum chart the difficulties of post war austerity Britain, and of your family life against this background. And, over and above all this, you are a very modern woman in a Britain that was only slowly and reluctantly moving to concede equal rights to women. Iʼve enclosed one of the Taitʼs Smiles cartoons that touches on women in a post-war Britain. I attached a significance to the fact that you or your Mum cut it out, and shared it between you. I am the author of You, You and You! The People Out of Step with World War Two, London 1981, a book that was based on 50 or so interviews I did with a selection of people whoʼs stories had not been heard up until that time: the West Indian volunteer, the Jewish émigré from Germany who along with other German jews had been interned by the British and then sent on the Dunera to Australia for the duration of the war (a film was made about this later), RAF mutineers on Gibraltar, women in munitions, in the docks, in the armed services, and so on. The correspondence between you and your Mum ends abruptly in 1950, at a point when you are doing a teacher training placement in a school in the North East. I was so enthralled at your life story that I wanted to know what happened next. I knew there was a Swedish family connection, and that is how I was lucky enough to make contact with Bjorn who told me that he had last heard from you in 2008, and very kindly gave me your address. I look forward so much to hearing from you. 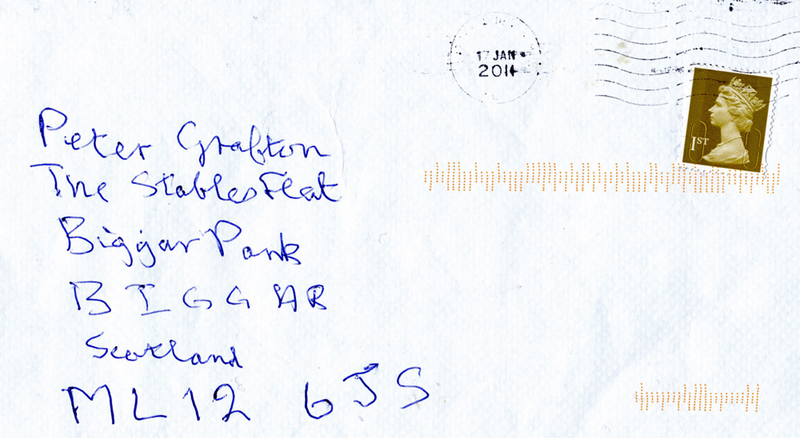 And then, a week later it came, a letter with handwriting I had last seen on an envelope from sixty one years before. I was living in Scotland at the time. She signed herself Helen, no longer ‘Len’. She said she had wondered what had happened to the letters, and yes, would ‘love all my ancient memorabilia back’. She had been living in Exmouth for twenty years with her second husband. At the time that he had died in 2007 Helen had fallen and broken her hip; her children by her first marriage were busy, so a friend of her second husband cleared out the contents of a small flat that he had kept on in London. And that is how the material came into the public domain. I learnt this went I went to see her in Exmouth, in March 2011, returning to her the correspondence, the photographs and the memorabilia. It was the most extraordinary week-end. Helen was still that ‘Len’ of her youth: feisty and engaged. 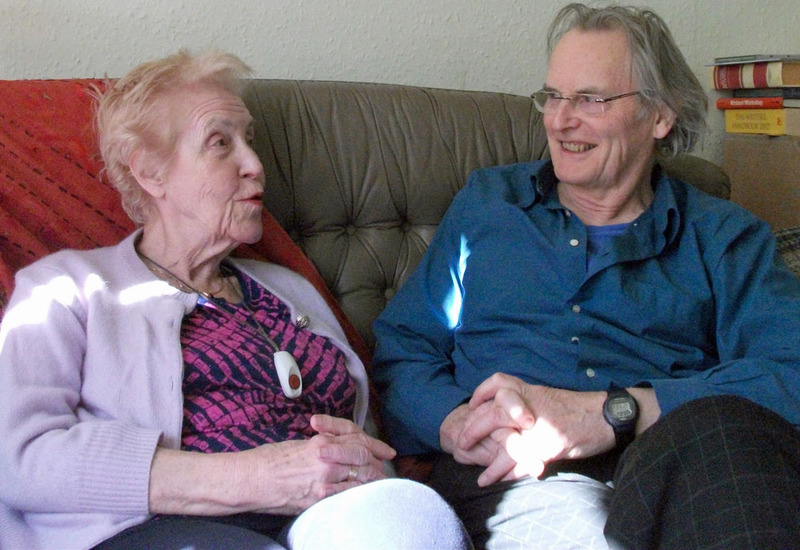 Rona, one of her children, down from Manchester, for my visit, told me that her Mum had run a therapeutic workshop in her seventies with the title “Life is Too Short to be Sensible”. To my surprise, because there is intimate and revealing material in the correspondence, both Helen and Rona were very positive about me continuing with the book: Rona because she felt it would be a memorial to her mother, and Helen because, as she put it ‘I am only interested in the present and the future’. In addition, in a forgotten small duck egg blue 1950s weekend case, on top of a wardrobe, were a further collection of 85 letters covering the same period, letters that filled some important and tantalising gaps in the correspondence. Not all missing biographical details could be filled in when I met Helen, as Helen has significant memory loss, possibly caused by medication to control the relatively late onset of epilepsy. However a few gaps and details in the narrative have been clarified, and her occasional commentary has been included. Although the intention was to look for an interested publisher, the world of publishing has been turned upside down, since I started transcribing the correspondence in 2007, by the development of the internet. Print publishing is in turmoil. This has meant that few publishers in the UK, and anywhere else – they can be counted almost on one hand – will in 2014 look at ‘unsolicited’ material. Reading unsolicited material – even an introductory letter and sample chapters from an author – requires paid readers, and this is a cost that is now balked at by publishers. Likewise literary agents, who in the past may have introduced a new writer to a publishing house, have also drawn up, with some exceptions, their drawbridges in regard to untested writers, or less known writers who have not published for a significant while. In many ways, the internet has given an interesting democratic power to the writer, and sites like Word Press, which I use, means the writer and his or her readers can be involved in an interesting two way-process. So I welcome comments, corrections and shared experiences arising from the online publication of Len: Our Ownest Darling Girl, and these could eventually be included in the body of the text as background material, or as footnotes. Part One: Growing Up in Britain 1925 – 1945. Part Two: Egypt 1945 – 1948. Part Three: Porton Down 1949. Part Four: Wynyard Hall Emergency Teacher Training 1949 – 1950. Most sections are very much focused on the correspondence between Len and her Mother. The exception is Part One, which sketches in the background to Britain as Len is growing up: there were few letters in this period, but the memorabilia from this time is heavily drawn on. Secondly, in Part Four, and to a lesser extent Part Three, the regularity of letters within the week decreases as telephone conversations between Mother and Daughter increase. Mum had a telephone installed in her rented home in 1949 – one of the first in her avenue, and a luxury for someone of her social and economic background. In this age of the internet – as telephones give way to mobiles – personal letters are becoming extinct. Therefore no record of the intimate lives that we live – through written exchanges – in the 21st century will be left to future social historians and a future digital reading public. My very grateful thanks to Helen and her daughter Rona for providing me with a second batch of family correspondence in 2011, and for their support in my continuing to work on, and completing Len: Our Ownest Darling Girl. Without Bjorn Mackay Palmgren this would have been a very different – and like most biography – speculative account. 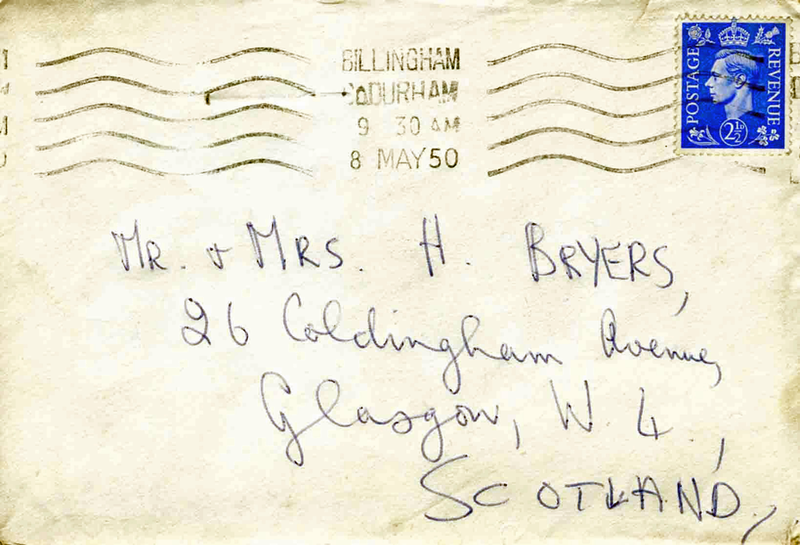 I am very much indebted to him for responding to my initial email, and for giving me Lens (Helen’s) address and subsequently telling me about some of the family connections and his memories of staying with the Bryers in Yoker in 1949. 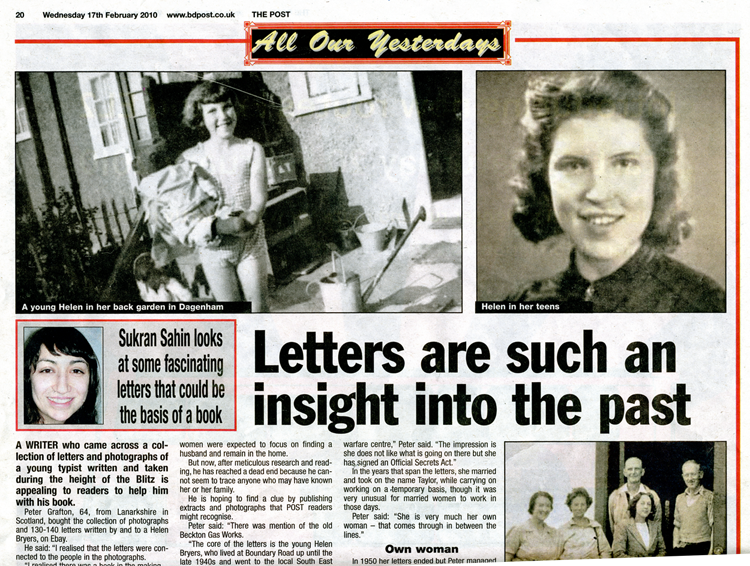 Thanks to Sukran Sahin for writing an insightful feature for the Barking and Dagenham Post, in February 2010. Mrs Alison Coleman of Carnwath, South Lanarkshire, a commissioned officer in the ATS during the Second World War read some of the early transcribed letters for me, pointing out typing errors. She also helped in explaining Scots expressions and words that cropped up in some letters, current in the 1930s and 1940s, but rarely heard now, or understood by younger Scots, and in some cases not listed in the AUP’s Pocket Scots Dictionary. Mrs Joy Wight of Morpeth, Northumberland, in age an exact contemporary of Helen (‘Len’), was very helpful in identifying and explaining some fashion phases and expressions of the 1940s, such as what a “Maria” hair style was. She also helped to facilitate the distribution of exerpts of the transcriptions of the correspondence to members of her Morpeth U3A reading group, and arranged a meeting where I could discuss and listen to their responses to the material. This was more than a year before I made contact with Helen. The ages of the all women group were from their fifties through to those in their 80s. The younger women in the group said they found reading the material helped them to understand the lives of their mothers as they grew up in the 1940s. All commented that in the age of texting, and mobile calls, there would never be again a written record through letters of contemporary times. A retired Primary School Headmistress, contemporary with Helen, had an interesting perspective on the Emergency Teacher Training Scheme, and how men who went through it often advanced their careers, leap frogging women teachers already in a teaching post. My thanks, then to those Morpeth U3A reading group members for taking time to read the exerpts and for their stimulating discussion. Liz Willis of Hanwell, London has been involved almost from the beginning, reading and proof-reading the transcribed letters as I worked through them. She has also been very helpful and stimulating in spotting connections that I missed, and working in tandem with me, in trying to locate in online Births, Deaths and Marriages records the places and the years of family members of Helen, her mother, and her father. Her knowledge of aspects of the work and history of the Porton Down Chemical and Biological Research Centre were also stimulating and helpful. Lastly, she has proof-read Len: Our Ownest Darling Girl, for which I am extremely grateful. Her proof-reading is eagle-eyed, and I am constantly amazed at the errors she has spotted. If any remain, the fault lies with me. So thank you, Liz. Lastly, my thanks to Elspeth Wight of Carnwath, South Lanarkshire, for living with the book as it developed, for the discussions and for sharing my excitement when I went to visit Helen for the first time, and for her support thoughout the project. lendarlinggirl.com is the online address of Len: Our Ownest Darling Girl. petegrafton.com takes the reader to the hub of all Pete Grafton online material.